From Nintendo we have new product named NES , yes the Nintendo Entertainment System™. 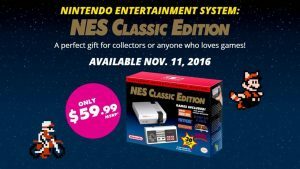 And now, a new, miniaturized version NES Classic Edition is here, pre-loaded with 30 of the all-time greatest games. Console also have HDMI output and it is just plug and play. Controllers are not compatible with old NES, but they are compatible with Wii and Wii U consoles conecting them to Wii Remote controller. Another downside is that you are limited to 30 games and no old cartridges will not be usable.